Local Woman to Compete on Jeopardy! Jeopardy! host Alex Trebek has a lot of answers, and a local woman hopes she has the questions he’s looking for. Arlington resident Melissa Jurgens, a lawyer, will compete on the popular quiz show. The segment was previously taped and airs tonight. 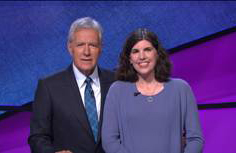 Although it’s a big secret whether or not Jurgens will advance, we are told she was able to meet and take photos with host Alex Trebek. You can catch Jurgens’ appearance on Jeopardy! at 7:30 p.m. on WJLA (Channel 7).